I recently got a new BMW 1 Series 116D (2016) on a 4 year PCP deal. A week in, I've managed to scratch the bumper. Although it's a minor dink, I don't want there to be any risk of it devaluing the car for when I eventually trade it in. Would you recommend repairing this myself or should I go back to the BMW dealership? What would be the price difference in the two and how would I go about doing a DIY job? It will most certainly be more expensive if you get a professional to repair this bumper for you. However, it will be a safe investment on your trade-in if it is restored professionally. We cannot discuss price on this platform, but, the cost to do this yourself versus taking it to reputable shop will be substantial. If you decide to do this on your own, it is optimal to remove the bumper from the vehicle. I do not know how far the damage travels, I would suggest repainting the full bumper. Blending is not easily accomplished for someone with no experience. Add incorrect paint to the equation, the wrong amount of coats, etc, it will never look the same as a factory job. You will need to acquire the paint code, which is located in your door jam, or sometimes in the glove box on newer vehicles. Take this to your local body shop supplier and get the matching OEM paint. If you have no experience sanding, I would recommend block sanding the bumper instead of using air tools.. You could start with something like 500 grit sandpaper. The areas with the dents or major gouges, cleanup with 80-120 grit. Once sanded, wipe the bumper down with a cleaning solvent such as Final Wipe. Cleanliness and temperature is key with bodywork. You want to paint in at least 20'C temperatures without high humidity. If it is too cold, the paint will sink. You can apply Bondo to the scarred areas. When applying Bondo, or any material for the matter, ensure that your trowel is clean and has no damage. If it does, this will leave streaks, pits, etc, all things you do not want. If there are any streaks you can use a cheese style grader on them once the material has tacked up a bit. Sand it down once again, this time you could use 220 or something similar. Once it is to your liking you can prime the areas in question, or the whole bumper. Before doing so, make sure you clean the bumper with the correct solvent and then a tack cloth before shooting any material out of your gun. Once primed, you need to sand again before your paint goes on. Sand it with 500-600 until everything looks dull. Clean it once again and you are ready to shoot your paint. Read the instructions carefully, flash times are different depending on the materials you get. You can ask the dealer how many coats of paint and clear was used on this vehicle. Try to match it. Shoot your paint and the required amount of coats, and then your clear. It should dry at least for 24 hours. You can look at cutting and buffing the bumper once completed. Not the answer you're looking for? 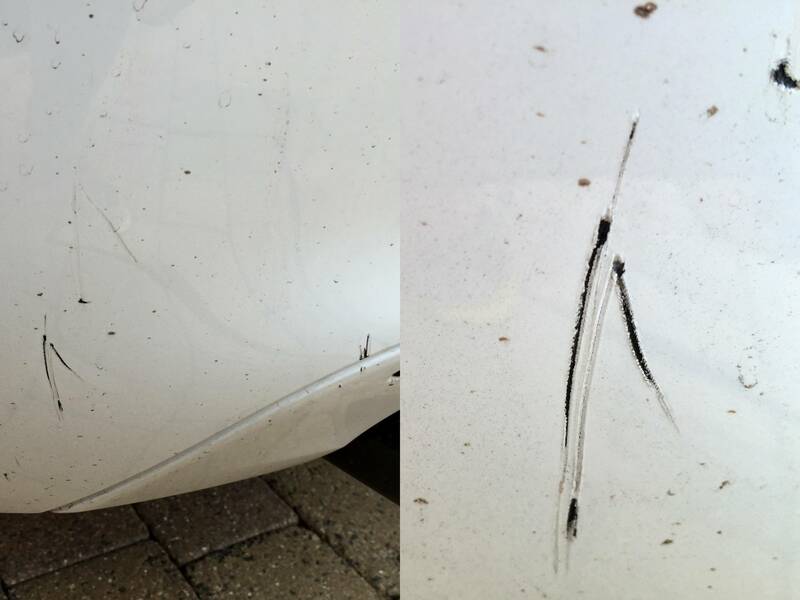 Browse other questions tagged bmw repair paint-scratches bumper or ask your own question. What's the best way to re-paint only a corner section of a bumper? How to repair my fiberglass front bumper? What is best way to fix this loose bumper? Any idea where this chrome bumper is from.